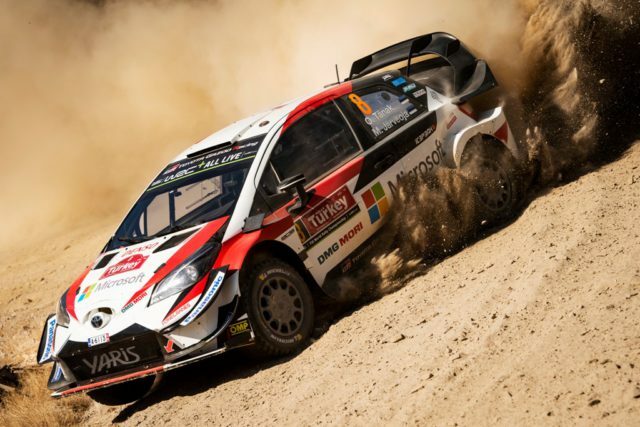 Ott Tanak leads Rally Turkey after one of the WRC’s most dramatic ever days. He led the enthralling four-day gravel road event by 13.1sec from Toyota Yaris team-mate Jari-Matti Latvala after title rivals Thierry Neuville and Sébastien Ogier retired and erstwhile leader Andreas Mikkelsen hit problems. A third successive victory tomorrow for the Estonian would increase the impetus gained by wins in Finland and Germany, setting up a three-way fight at the final three rounds to decide the most exciting championship battle in recent memory. That happened in this morning’s opening speed test. He limped to the finish and tried swapping suspension parts from the rear to the front but the damage was too great. Ogier was left with a 22.5sec lead but the Frenchman struggled to the finish of the following test with a broken front right wishbone on his Ford Fiesta. 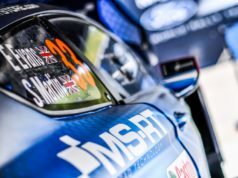 He wrestled to install an ill-fitting replacement, helped by team-mate Elfyn Evans who stopped to relay advice from team engineers in the service park by telephone. “I thought I would never make it. We tried to put the track control arm back but the suspension wishbone was too tight in the sub-frame and I couldn’t fit it in. 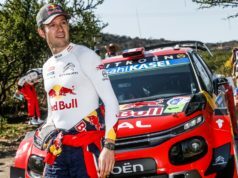 I fought like hell and was very close to giving up because I had no energy,” said Ogier. 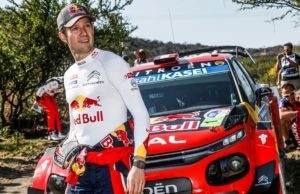 Time penalties for arriving late at the next stage relegated the Frenchman to fourth but his hopes were extinguished when he slid wide in the afternoon’s opening stage. Mikkelsen regained the lead he held for much of yesterday but a transmission problem left his i20 with only rear-wheel drive all afternoon. He conceded almost four minutes and plunged to fifth. “We knew from the beginning it would be tough and we didn’t have the performance so we had to keep it on the road,” he said. Haydon Paddon is almost a minute adrift of Latvala in third. It was a disastrous day for Citroen’s Craig Breen and Mads Østberg. Breen’s C3 caught fire and burned out while Østberg stopped with a broken turbo. Esapekka Lappi retired his Yaris from sixth when he crashed. Sunday’s finale is short but no less demanding than the previous two legs. Drivers tackle four stages covering 34.98km, the rally ending with a second pass over the 7.14km live TV Marmaris Power Stage, with bonus points available to the fastest five drivers.